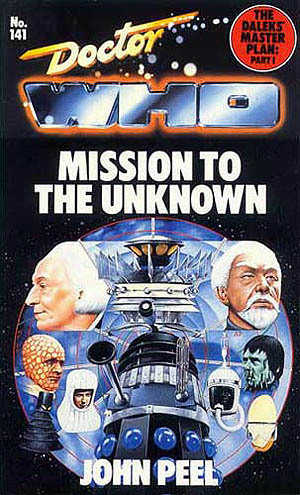 Mission to the Unknown was originally a one-shot story that presented background information for the larger story, The Daleks’ Master Plan. This review will examine the book adaptation of Mission to the Unknown which has elements of The Daleks’ Master Plan within its narrative. Consider this post as Part I of a two-part series examining this epic chapter of the Doctor’s adventures. An expedition from Earth discovers a deadly secret on a jungle planet. I know that there have been times when I’ve read a Doctor Who adaptation and immediately thought, “Damn it, man! Why on God’s green earth did you have to destroy those tapes.” I probably should pre-apologize for how many times I’ll probably will mention this as we head towards the bulk of the Missing Episodes. This episode, which will be paired up with Episode 20, is one of those times in which I have feel very angry about the Missing Episodes. This would have been amazing to watch. I know that the audio still exists for this Episode and for Episode 20 but it’s not the same as having the full experience. I believe that is one reason why I haven’t updated in quite some time. I had thought about pairing the readings with an of the surviving audio adventures but it turn out to be too time consuming for someone with two jobs. Maybe in the future, but I’m anxious to get back to blogging, so no on the audio…for now. The adaptation begins with the point of view of Katarina, who served as a handmaiden for Cassandra, the Trojan prophetess. Before we go any further, I have to mention how much I really liked Katarina. There’s a part later on that I’m not happy with in how they treated this character but I have to mention that I admired her spirit. Katrina was the first companion of the Doctor’s in which her background was of the past as opposed to the present or the future. (Barbara and Ian were of the present timeline, while Vicki and Steven originated from future timelines. Susan could be considered neutral as she began her travels at the same time as the Doctor.) Even though Katarina possesses a more innocent mind due to her background, she is still a fighter and more than worthy to be aboard the TARDIS. It does get a bit tiring of how some of the “modern” characters will talk down to her like a child. She’s from the era of Troy, of Myth thrust upon a future setting. She’s doing pretty well considering the shock of the transition. As we begin this story, the Doctor and Katarina are dragging Steven from the battle of Troy back to the TARDIS. Unlike the previous book adaptation, in which it is mentioned that Steven was fine as they left Troy, he has been wounded and it is feared that he might be in danger due to infection. The Doctor is worried about infection, while Katarina, who has seen wounds similar to Steven’s in her experience at Troy, is sure that Stephen is on his way to his death. As the Doctor sets course to a time of civilization in which antibiotics are more readily available, we now shift to a jungle setting, or the setting of the one-off episode call the Mission to the Unknown. Let’s pause here and consider what it might have been like for the audience. Here they are expecting another exciting episode with the Doctor and they get this strange jungle episode in which men go mad and the jungle screams only add fear to those brave, or stupid, enough to explore. This entire portion is a great part of the book adaptation. It’s creepy, strange, and unworldly. I know that Doctor Who is a science-fiction program but because of the historical elements that are showcased in the show, sometimes that sci-fi portion is ignored. This portion combines the older sci-fi mentality and adds a bit of horror for a very entertaining read. I couldn’t help but consider Jeff Vandermeer’s recent Southern Reach trilogy which has roots in the weird fiction genre. There is a desperate struggle between the jungle and the human explorers only to discover that there is a bigger threat beyond the power of unworldly nature: the Daleks. I know I’m repeating myself but I really liked this portion of the story. It sets up Episode 20 so well and provides a feeling of fear for the audience members. They know that the Doctor is about to face the Daleks in later episodes but as the jungle is a vicious force of nature, will the Doctor have more than one enemy in battle? From here on in, the book adaptation becomes an adaption of Episode 20: The Daleks’ Master Plan, hence the need to make this a two-parted review. Except for the following notations, I will be pausing in this review and continuing to exam the rest of the adaptation in correlation with The Daleks’ Master Plan in the next post. The Daleks’ Master Plan also introduces Sara Kingdom, a great badass character played by the amazing Jean Marsh. There’s a great tension between Vyon and Kingdom that plays out really well in the book. And it’s something that I look forward discussing in the next post.